Gnocchi, You Will be Mine. 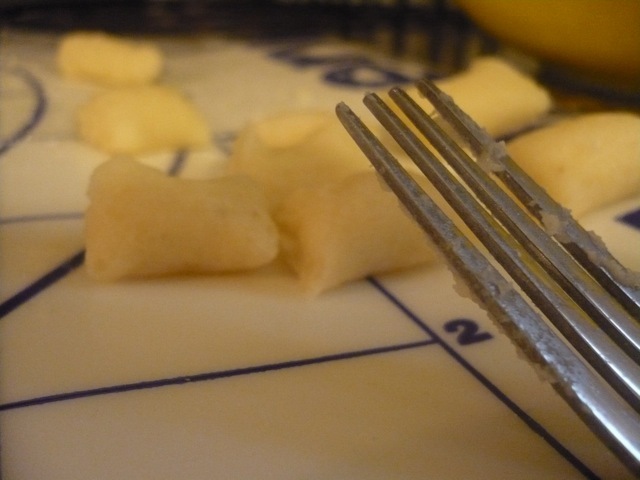 The idea of making homemade gnocchi has been in my head for years – ever since I had it for the first time four years ago. See, once you’ve had homemade (and that’s the first way I ever had it) the frozen stuff is just not as good. Don’t get me wrong – given the choice between frozen gnocchi and any other kind of pasta, I’m going to pick the gnocchi every single time. But I was nervous terrified. What if I screwed up something that I love? What if I told people I was making it (which I did, because why not add some more pressure to the equation? ), then I tried and it just bombed…the dough didn’t come together, or the potatoes were too gluey, or…something. What if I wasted three hours of my precious, precious weekend and had nothing to show for it other than a kitchen covered in flour and congealed potato (I bet you’re hungry after that description)? So what was the solution to eventually calming those many, many nerves? Two delicious bottles of Spanish red, to be precise, that were both empty by the end of the process (before you pass any judgment on my drinking habits, Boyfriend was also drinking it and this was an all-day event). Because if I’m going to be making pasta all day like a tiny old Italian grandmother, I think red wine is really a necessity. But then again, there are very few occasions where I don’t think wine is a necessity. Anyway, yesterday I bit the bullet and gnocchi was made. Lots of gnocchi. I actually should’ve made more, because I brought a bunch of it to work today (stupid) and now I just have the bag of it that I froze, because let’s face it – I don’t love my coworkers enough to bring them all of my homemade gnocchi. I had psyched myself up for this process to be a whole lot harder than it was. Like, tears-in-the-dough-when-will-it-all-be-over-why-did-I-even-start-this-project harder. But it wasn’t. Basically, the potatoes are pricked all over with a fork, baked for an hour, peeled, grated (my kitchen obsessions are not such that I have a potato ricer or a food mill), mixed with some salt, egg and flour, formed into dough, rolled into snakes and cut into little nubbins. Sounds like a lot of steps, but really? This is homemade pasta, people. It is a labor of love.